The Wilmington City/County Building is located at 800 French Street, Wilmington DE 19801; phone: 302-576-2100. 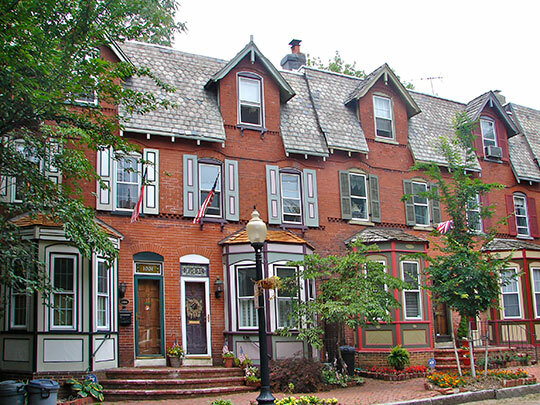 Photo: Homes in the Shipley Run Historic District, Wilmington, DE. The Historic District was listed on the National Register of Historic Places in 1984. Photographed by User:Smallbones (own work), 2011, [cc-by-1.0 (creativecommons.org/publicdomain/zero/1.0/deed.en)], via Wikimedia Commons, accessed July, 2015. Wilmington lies between two rivers, the one adapted to navigation and commerce, the other to mills and manufacturing establishments. In these respects Nature has made our city to resemble the metropolis of Pennsylvania, while Art has been actively engaged in carrying out the resemblance. The streets of Wilmington are all laid out at right angles with each other, and those running from river to river are crossed by others that are named numerically. Through the central part of the city runs the main street, which is called Market street; the others running parallel to it, are mostly named after the trees of the country, and after distinguished individuals. The reader will perceive in all these circumstances the striking resemblance between Philadelphia and Wilmington. The truth is, that the founders of our city were humble copyists, but in general judicious ones. The world could have hardly afforded them a better model. There have been several attempts to improve upon Penn's plan, but they have all failed; and the city of Washington, whose founders had every advantage which talents, knowledge, and pecuniary resources could give, have perhaps failed the most conspicuously. No plan yet adopted for a city, whether with a view to business, cleanliness, health, convenience, or economy, has been found to answer these purposes better than that in which the streets are laid out at right angles, from fifty to one hundred feet wide, according as circumstances dictate. The citizens of New York have adopted this plan in the new parts of their city to great advantage. Wilmington is "a city set upon a hill," the highest point in Market street, near the great reservoir or basin, is one hundred and nine feet above the tide. This point is attained by a gentle ascent from the Christina, and distant from it three thousand seven hundred feet, being more than two-thirds of a mile. The distance from this point to the river Brandywine is seventeen hundred and thirty-two feet, making the whole distance from river to river, one hundred and fifty-two feet more than a mile. Although Wilmington stands on a hill of such elevation, it is partly surrounded by a chain of hills still loftier, nearly in the form of a crescent, and distant from one to three miles. Beginning at the "high hills of Christeen" near the Delaware, and in a north-east direction from the city, they sweep round towards the north and west, with varying height, and waving outline, until they subside nearly in a south direction on the road leading to New Castle. The city stands on ground which gradually declines towards the east, until it finds both a natural and legal boundary in the two rivers, Christina and Brandywine, where they meander through the meadow lands beyond the old church, to meet each other and mingle their waters before they enter the Delaware. The Christina approaches the city from the southwest, and is navigable for sloops of fifty tons about ten miles beyond it. The Brandywine comes to us from the north, having within four miles, a fall of one hundred and twenty feet, affording great power for manufacturing purposes, to which a considerable portion of its forces has already been applied. It is navigable for vessels carrying 2000 bushels of wheat, as high up the stream as the mills, which are situated at the northerly extremity of the city. They are thirteen in number, and have long been celebrated for their power and efficiency as flour manufactories. The land on which the city of Wilmington now stands, was granted by Colonel Francis Lovelace, Governor General of the territories held by the Duke of York, to John Anderson, and Tymen Stidham. The grant to Stidham is dated at Fort James in New York, the old Fort Amsterdam, the 23rd of May, 1671. Anderson's patent was probably taken out about the same time. The date is uncertain, but it could not have been later than 1673, as Lovelace left this country in that year, and did not return. Anderson's tract contained eight hundred acres of land. It was bounded on the north by Stidham's land, on the west by Rattlesnake run and a line of marked trees, on the south by Christina, and the meadows then under water, etc., and extending eastward into the neighborhood of the old church. On the 16th of April, 1675, Anderson, by an article written in the Dutch language, and which is now in the writer's possession, granted to Samuel Peterson and Lars Cornelison, one-half of his landed property, without stating or making out any definite line of division. Lars Cornelison sold his claim under the article to Justa Anderson. Anderson assigned his interest to Matthias Defoss, who afterwards sold it to a certain Charles Pickering; Peterson in the meantime holding his share under the original contract with Anderson. Such was the position of the parties holding under old John Anderson, in the year 1686. At that time Anderson was dead, and all the owners agreeing to divide and hold their respective shares in severalty, employed Thomas Pierson, an official surveyor under the governor, to survey and lay them out accordingly. By this division, which was made on the 26th of the First month, old stile, 1686, corresponding to the 6th of the Fourth month, April, according to the present mode of dating, Samuel Peterson's tract was bounded as follows: Beginning at a thorn-bush standing in the middle of French street, and nearly in the line of the lower side of Water street. It then passed up and along the middle of French street to a point about two perches above the upper line of Third street, thence by a line running diagonally across the town, in a northwesterly direction, and passing through the easterly end of the upper market house, to the easterly end of Love lane, thence continuing the same course partly along the lane to a stake somewhere near Rattlesnake run, standing at the distance of 444 perches from the beginning of the line. From this point, the boundary line, by two courses in a southwesterly direction, extended fifty-five perches to a stake, and thence in a direct line to the mouth of a small rivulet which then entered the Christina, in a piece of low ground, formerly belonging to Frances Way, which lies a little west of John Hedge's rope walk, and thence by the margin of the creek to the thorn bush. The rivulet alluded to now crosses Front street in a culvert, at its intersection with West street. In some places, the line terminating at the mouth of the rivulet, yet remains as a boundary line between lands lying west of the city. Westward of the old King's road it divides the land late of John Way, now of Dr. Coxe, from the lands belonging to New Castle county, for the support of the poor. It is marked by a row of Lombardy poplars, as it passes along between the poor house and the city, and may be distinguished from all others by its diagonal direction. The tract assigned to Charles Pickering, began at a Spanish oak, near the head of a rivulet known as "Stalcop's run." This tree stood in what is now Poplar street, about five perches below Seventh street, within five or six feet of a spring, which still sends forth a small stream of water. It was at a corner of lands of the late William Kirk and Patrick O'Flinn. From this point the line extended in a northwest direction four hundred and sixty perches, or nearly one mile and a half, to a white oak tree, in the vicinity of Rattlesnake-kill. It still forms a dividing line to several lots westward of Tatnall street, and is the south-west boundary of lands of the late Dr. Wm. Gibbons. From the termination of the last mentioned line, Pickering's tract was bounded by a line running southwesterly seventy-four perches to a corner of Peterson's land, at the end of the four hundred and forty-four perch line, thence by that line to its beginning in French street near Third street, thence down French street to the old thornbush, thence by the shore of the Christina to the mouth of Stalcop's run, thence along the run to the Spanish oak at the beginning of the survey. The remainder of old John Anderson's land was divided between Christiana his widow, and Andrew his oldest son. The widow took all those parts of it lying eastward of Stalcop's run, and northward of Pickering's tract. It was bounded by Tymen Stidham's land on the north, by a line at or near Rattlesnake run on the west, and on the south by the Christina. Its eastern limits is not precisely known, but it was near to the church yard, as appears by the article with Joseph Yard, for building the church. Andrew's portion lay on the southwest of Peterson's tract, and extended westward beyond the poor house about half a mile. How far southwestward its extent is not certainly known. It included all the lower part of Clement's creek, which is the first stream crossed on the Wilmington and Christiana turnpike road, by travelers in the route to Baltimore. On the westerly part of it stands the Poor house, Galley's boarding school, the toll gate on the Wilmington and Lancaster turnpike, and a number of dwellings belonging to the descendants of Andrew Stalcop, the son of old John Anderson, or to their assigns. The five tracts already described, include all the lands now within the corporate limits of the city of Wilmington, excepting perhaps, a small part of the Brandywine marsh. The patent to Tymen Stidham may include the whole of that marsh, but from the loose and indefinite character of the description, this is not quite certain. The grant by Sir Francis Lovelace to John Anderson, like that to Tymen Stidham, was for the purpose of confirming to him his right, obtained either by purchase or original possession, most probably by purchase, for Anderson was a Dutchman, and the land held by him, was in the possession of the Swedes, at the earliest settlement of that people on the shore of Christina. The time of Anderson's arrival is not known. It is probable he came to this country after its capture by the Dutch, at a time when the fort at the rocks was abandoned as a military post; and when his Swedish neighbors were willing to occupy lands more remote from scenes which reminded them of their defeat and subjugation. Here they had lived as lords of the land, the surrounding nations bringing their treasures and pouring them out at their feet, and here the crown had been taken from their head. Where they once reigned, they had become captives, and in sorrow of heart had often "hanged their harps upon the willows." Tradition informs us that Anderson came over from Holland as cook on board a Dutch ship. He wore a woolen cap, which, during the voyage, he so frequently used instead of a towel, that it became perfectly saturated with grease, and by constant handling acquired a very smooth surface, which reflected the light like polished steel. Hence the sailors nicknamed him Staelkappe, pronounced "Stalcop." The truth of this traditionary account is much strengthened by the fact, that in the article of agreement with Samuel Peterson and Lars Cornelison, he signed his proper name Johan Anderson. In deeds of conveyance from his descendants reciting their title under him, he is called John Anderson Stalcop. His son John was actively concerned in the erection of the church at Christina, and in the contract with Joseph Yard he signed his name John Stallcop. On the division of the landed estate as aforesaid, his son Andrew is called Andrew Stalcop; and his widow is named Christina Stalcop, and called in the writings John Anderson Stalcop's widow. There is no evidence that the name of Anderson was retained by any of his posterity. He left four sons, Andrew, Charles, John, and Peter, who all took the nickname of Stalcop, which has descended to our own times as the family name, and as such is inscribed on the monuments of their dead. One of the last of the name, who possessed any of the family domain, was Andrew Stalcop. One of his daughters married Andrew Crips. She was the mother of the family of that name, yet living on part of the old tract. The wife of Andrew Stalcop long survived him, living in a small tenement on the westerly part of their land. She was subject to occasional fits of insanity, in which state she would come into the town; and is still vividly remembered by those who were children at the time, and who had been terrified by her "wild conduct, and had trembled at the sound of her name. Sixty years ago, the urchin who was tempted to wander from home, was kept within due bounds by the fear of Hannah Stalcop. The tract which was Charles Pickering's, afterwards became the property of the Swedish Congregation, and was long known as "the church land." In the year 1736, the congregation by an indenture under the hands of John Eneberg, their minister, Charles Springer, Jacob Stilly, and Garret Garretson, then church wardens; and Philip Van De Vere, Mouns Justice, Timothy Stidham, Lucas Stidham, and Morton Justice, their vestrymen, together with many of the most conspicuous men of the congregation, appointed Charles Springer their trustee, who, with Jacob Stilly and Garret Garretson, their church wardens, and their successors, were authorized to lease and demise for term of years or for ever, in small lots, any part or parts of the said church lands. The town of Wilmington had just been laid out, and between thirty and forty buildings erected. The church lands occupied that part of the city which is now nearly central. The prospect of rapid improvement in the value of their property, induced the congregation to come into the market with lots to lease at moderate rents; and had it not been either for the superior wisdom, or great want of foresight, in those who had the management of their real estate, the church at this day would have been much too rich for the best interests of any ecclesiastical institution. The tract which became the property of Samuel Peterson, he by his will dated November 20, 1689, devised to that son who should live longest with his widow. Under this singular devise, his son Peter took the plantation, and his son Matthias, by deed dated December 4, 1702, released to Peter all his claim on the land. Peter held the tract during his life, and by his will dated January 29, 1714, devised it to his son Peter Peterson. He by deed under the hand and seal of himself and Magdalen his wife, dated May 8th, 1727, granted and conveyed to Andrew Justison, all that part of the plantation lying on the Christina, extending from the old thorn bush on the shore at French street, to the mouth of the rivulet west of the rope walk, on land late of Francis Way, and thence westward, within lines already described, to the dividing line between Thomas Shipley, and the assignees of the late John Way. This dividing line runs from Love Lane across the country, to a corner of Simpson's land, in the old diagonal line. This sale to Justison is one of the connecting links in the chain of causes which gave rise to the city of Wilmington, and it appears probable that he made the purchase with the view of laying out a town. Ferris, Benjamin, A History of the Settlements on the Delaware from its Discovery by Hudson to the Colonization under William Penn to which is added an Account of the Ecclesiastical Affairs of the Swedish Settlers and a History of Wilmington from its First Settlement to the Present Time, 1846, Wilson & Head, Wilmington.